This Universal wireless removable keyboard w/ touchpad is for Tablet between 8″ to 9″ inch size. Stylish, and high grade protective PU leather case from damage and make easy for carrying ,With display stand for easy viewing, With LED indicators. Good touch feeling. Features: 1. Bluetooth 3.0 interface standard 2. Working distance: 10m 3. Input: Micro USB charge 5V 4. Li-ion battery Capacity:450mAh 5. Operating Voltage: 3.7V 6. Keyboard Standby Time: Approx 30 days 7. Working Time: 60 hours 8. Charging time: 2-2.5 hours 9. Operating Temperature: -20℃-55℃ 10. Material: ABS(the keyboard); PU Leather (the case) 11. Color: Black 12. 378 g / 13.4 oz 13. keyboard size: 23 cm X 15 cm (9.0″ X 5.9″) Speicifications: Bluetooth version: 3.0 Operation distance: Up to 10m Operation voltage: 3.0-5.0V Lithium battery capacity: 650mA Working current: < 5.0mA Standby current: 2.5mA Sleeping current: < 200uA Charging current: > 100mA Standby time: 60 days Charging time: 4-4.5 hours Uninterrupted working time: 45 hours Lithium battery life: 3 years Lithium battery dimension: 45x25x47mm Key life: 5 million strokes Material: Plastic (Silicone rubber); PU (the case) Color: Black Compatible with: 8″ ~ 9″ inch size Please Note: The touchpad function is only for Android and Windows System. Apple iOS won’t work. Tablet Stand was made of high strengthened alloy steel material, higher strength and lighter weight. We are committed to provide you with life time warranty! Why you choose KitBest Tablet Stand? Most tablet stand brands cannot give you a life time warranty as they know their products are not good enough. With this in mind we stand by our Tablet Stand and provide you a life time warranty. 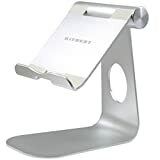 KitBest iPad Stand is adjustable and portable, which fits for all 4-13 inch Smart phone, E-reader and Tablet, such as iPhone iPad Pro, iPad Air, Surface Pro, E-readers, Kindle, Samsung Tablet. The rubber protect the point of contact between the device and the stand which keeps your device from scratches and sliding. 【 Why Special 】Stand for iPad was made of spaceflight Al-Ti alloy and super high strengthened alloy steel material, higher strength, lighter weight. The tablet dock is made of robber which effectively prevents scratches on your lovely device.